The history of the creation of Periodic table and of the Mendeleev’s discovery of Periodic Law is considered. 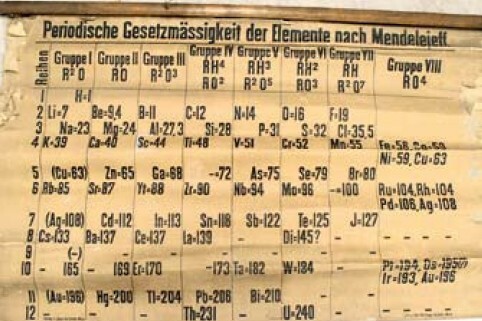 The different approaches used by Mendeleev’s colleagues are discussed. The contribution of the Periodic system to the extension of the scientific ideas in geology and best of all in geochemistry and mineralogy is illustrated by the discovery of new chemical elements and by the isomorphic replacements in minerals. The details of uneasy history of Mendeleev’s nomination to the St. Petersburg Academy and for the Nobel Prize are given. D.Yu. Pushcharovsky, born in Moscow in 1944 and graduated from Moscow State University in 1967. He was named full professor in 1992, and in 2002 he was elected Dean of the Faculty of Geology. He was named Academician in 2008. He is an author of over 450 articles, contributed to descriptions of 40 new minerals, and served as chair of the IMA Commission on the Classification of Minerals (1998–2006). He has written 7 textbooks on structural mineralogy and X-ray crystallography. In 2001 he was awarded the Lomonosov prize for his academic activity and in 2015 – the Fedorov prize for his works in mineralogical crystallgraphy.